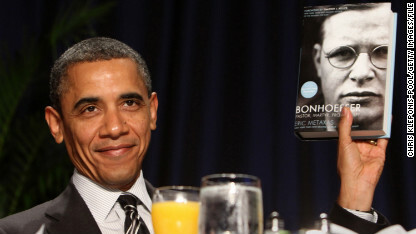 Author Eric Metaxas speaks alongside President Barack Obama at the National Prayer Breakfast in Washington in February. 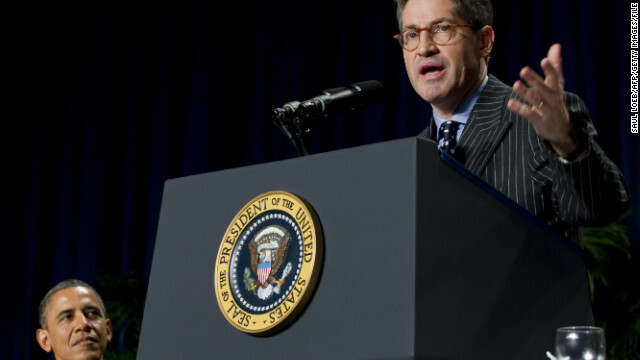 Editor's Note: Eric Metaxas is the author of "No Pressure, Mr. President! The Power Of True Belief In A Time Of Crisis: The National Prayer Breakfast Speech." (CNN)–Imagine that the president of the United States had to sit and listen to you for 30 minutes in a public setting. Imagine that he couldn't escape and had to endure whatever you said. If you disagreed with him politically, would you try to embarrass him? What would you say? Well, this actually happened to me. A year ago I was invited to be the keynote speaker at the National Prayer Breakfast in Washington, an event attended by the president, first lady, vice president, and 3,500 other dignitaries. No one was more shocked at the invitation than I. Previous speakers include Mother Teresa, Tony Blair and Bono. No pressure. By the way, I disagree with the president in some important ways. But as a Christian, God commands me to love those with whom I disagree, to treat them with civility and respect, as creatures made in God's image. That's a command, not a request or a suggestion. Again, no pressure. In my speech I spoke about my heroes, William Wilberforce and Dietrich Bonhoeffer. Wilberforce's faith led him to fight for the Africans being enslaved by the British; Bonhoeffer's faith led him to fight for the Jews being persecuted by the Nazis. I used them as examples of people who passionately lived out their faith by standing up for their fellow human beings when most around them merely gave it lip service. I also joked around a lot, because as any of my friends will tell you, one of the ways I show love is by joking and teasing people. Who said prayer breakfasts had to be boring? At one point I said that George W. Bush had read my Bonhoeffer book, and then I glanced at President Obama and said "No pressure." I'm glad he laughed! Later in my speech, I talked specifically about the idea of loving our enemies. I said this was the test of real faith. Speaking to my fellow pro-lifers, I said that those of us who believe the unborn to be human beings must love those on the other side of that issue. I also said that those of us with a traditionally biblical view of sexuality are sometimes demonized as bigots, but we must love even those who call us bigots. I cited Wilberforce and the Rev. Martin Luther King Jr. as two men who took seriously God's command to love their enemies in the midst of the most serious political battles of their day. They honored God in how they fought, and he honored them. At the end of the breakfast the president told me he would read my book on Bonhoeffer, and Vice President Biden took my picture with the president. No kidding. It was an extraordinary day and I'm not telling the half of it. But the reason I'm writing now is that during the past election I was disappointed to see the president's campaign utterly abandoning these ideals of treating your opponents as you yourself would wish to be treated. Good people with principled and profound convictions about when life begins were cynically demonized as "enemies of women." Americans who had worked hard to build businesses, and who had given millions to charity and to the government, were denounced as fat-cats who weren't "paying their fair share" and whose wealth was ill-gotten gain. These scorched-earth tactics were not presidential, much less Christian, and because the president openly professes a Christian faith, I feel I must speak about this. Of course many will dismiss campaign hardball rhetoric as "what works." This is to miss the point. What we say matters deeply, and how we say it matters deeply. All of it has serious long-term consequences. For all of us. For one thing, our children are watching and listening. We tell them it's less important who wins or loses than how we play the game. Is there no truth to this at all? Do we not see that this behavior erodes faith in the very political process and in democracy itself? Do we not see that by doing this we encourage our opponents to do the same - and worse - the next time around? Shouldn't we care about that? Any victory won in an ugly way is somehow a tainted victory. In this case, the president has "won" a deeply divided nation, one that he - alas - has had a hand in dividing. Now what? If he is to succeed in the tremendous challenges that lay ahead, he must repent of these tactics and must make amends with his opponents, if it's not too late. Or else he will face gridlock and more gridlock. He also must show the door to those who cynically encouraged this "winning is the only thing" behavior. His legacy and America's future depend upon it. Many will be praying for him. The opinions expressed in this commentary are solely those of Eric Metaxas. Clearly Obama and the Democrats are the ones to originate hate and fear-mongering political strategies. Seriously?! History people. History – Republicans began this ugly style. Both should be ashamed. It's simple trickery to blame the winner and an easy way for the author to get press. After all, who's going to read about the runner up, what's his name? Correction you pointed out that religion is hurting Americas education. I said I could make a argument the the religious type would strive to excel in school. One point as you stated would be the decline of Christianity and corresponding decline of math and science scores. Your god just watched 18 innocent children get slaughtered in Connecticut. Thats some god you've got. That's right...let's blame this on God. We push God out of our live, marriages, families, and schools...then want to blame him when the world falls apart. God is not to blame. The evil one comes to kill, steal, and destroy. But those with darkened hearts and blinded eyes cannot see this. Correction your saying that religion has brought our scores down. America and decline of education is exactly what I'm talking about. This argument helps my point. The news today, our 8th graders are scoring low in science and math than many other countries. What a surprise!!! We live in a country where over %40 of the adults are still so ignorant as to believe the earth is less than 10,000 years old, where that many deny evolution is a FACT and the foundation of modern biology. (It was nice to see Mr. TV Religion Pat Robertson come out and say "If you fight science, you're going to lose your kids.) RELIGION IS THE ENEMY OF OUR WELL BEING AS A NATION. Why use religion as a escape goat? If you think religion is solely responsible for low scores in science and math you clearly have a agenda against religion. We live in a society that doesn't value hard work; kids see TV and think they can have the "good life" by becoming a reality star and so on...If kids don't excel in school its not because of religion, I could argue that the religious type would strive to excel in school to set a example of how to carry oneself in life. Teachers are paid poorly, schools have poor funding to name the two large problems with our education system. Also to afford college is difficult in this economy, not impossible but difficult. I agree the nations is falling behind the curve but blaming religion is a failing to take responsibility and not a solution. We need to instill in our kids that working hard towards education will have a big return in life and lead to a better quality of life. Kids that fall behind the curve have their priority's wrong; trust me kids aren't sacrificing general education to become pastors. Weirdly contradicting your assessment of a decline in education is that at the same time there has been a decline in Christianity in America. So under your premise then test scores should have increased and not decreased. Maybe you're actually making the case that drawing correct conclusions about the existence of an Intelligent Creator is a predicate for active learning and academic success. By the way the age of the Earth is not a standard in Christianity. The 10,000 yr old earth theory is not what's holding math and science back. Modern cosmology is the foundation for the belief of many believers and further knowledge is highly sought after. I don't think changing over to ID will do the job either. The problem is in society as a whole, kids aren't being brought up with the idea of working hard towards education so you can have a good life. Everyone wants to get rich quick... morality has fell off and so has general education. The wicked are worried about math and science scores not realzing we have a greater need...of God himself.